I’ve been in a baking mood the last month and heard about an Italian gluten free ricotta cake. 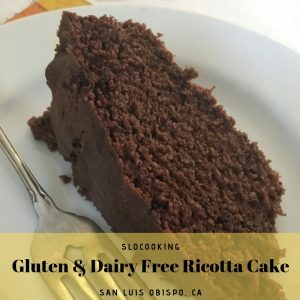 I looked around and found a recipe, then tweaked it to be not only gluten free but dairy free as well. My entire family loved this. It had a rich buttery texture, was sweet but not overly sweet the way American baked goods can get. This cake can easily be eaten with coffee after dinner or at breakfast. Would you like a FREE COPY of my weekly menu planner? Be sure to sign up for my newsletter HERE to get a copy. Did you know I have a posted list of recommended cookbooks on my website? Click HERE to visit that page. You can visit my KITCHEN GADGETS page for recommendations of my must have list of kitchen equipment too. Are you following me on FaceBook? sloCooking posts contain some contextual affiliate links and sponsored content. An affiliate link is a link in which retail partners have agreed to pay a small commission for purchases made from that click-through. As always, I recommend only those products that I would purchase for my own kitchen and home. Thank you for supporting the partners that allow sloCooking to do what I do. 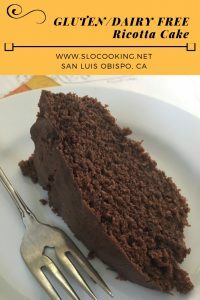 All content found on this site (including recipes and imagery) is original and created by sloCooking unless otherwise noted. As blogging is community driven in nature, please feel free to borrow an image or link to a recipe as long as it is credited and linked back to sloCooking. But please don’t give away the everything by publishing both an image and the full recipe. Questions about using content from sloCooking more specifically? Just contact me. Happy Cooking! © 2006-2019 by Heather Thomas, sloCooking.net. All rights reserved.